Pearl Necklaces – Customized Specifically for You! Looking for the perfect pearl necklace but just cannot find THE one? 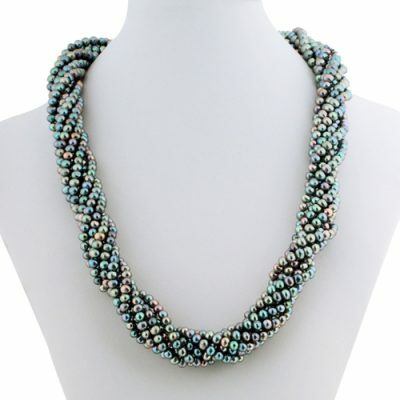 OrientalPearls.net has trained artisans that can take your fantasy and make THE pearl necklace a reality. All custom order comes with a free 6-month warranty. Check out our collection of pearl necklace for sale and pick a one for your special one! How to choose the right pearl necklace for you? A necklace 14 inches to 15 inches in length that rests on the collarbone. Choker pearl necklace generally surround the middle of the neck. They are usually made up of three or more strands and lie snugly on the middle of the neck. 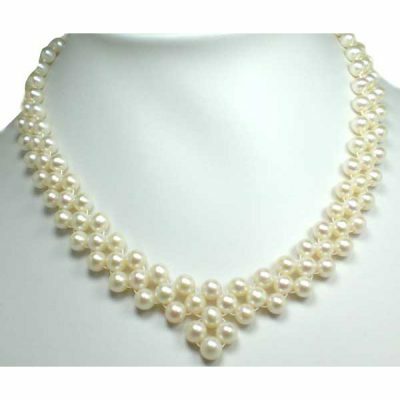 The classical pearl choker necklace is Princess Diana’s Striking 4 Row 5-6mm Pearl Collar Necklace. The most common length for pearl necklaces, it is well suited for crew and high necklines. Princess pearl necklace lies above the collarbones. An 18-inch necklace strung with either graduated pearls is considered the classical pearl necklace. This is an excellent choice if you are not certain which strand length is the most appropriate. A slightly longer pearl necklace, usually 20 to 25 inches in length. The matinee pearl necklace usually falls to the top of people’s bust. It is often used in combination with a shorter strand. The matinee length is an ideal choice and looks best on the neck. Also it is very well suited for fancier wear such as long sundresses and formal gowns. A 30 to 36-inch opera necklace that falls to the breast bone and can be worn either long or doubled. It can be knotted at the neckline to create a stylish vintage look that is gaining popularity as a contemporary fashion trend. Opera necklaces make a short neck appear graceful and elegant. See the hottest 36in round pearl necklace with 925 sterling silver clasp. Any necklace longer than opera length. Ropes are often worn knotted or shortened for added versatility of style. This versatile length may also be tried in a knot for a charming modern look reminiscent. Pearl ropes can also be knotted and slung over the shoulder to accentuate the beauty of a backless dress. 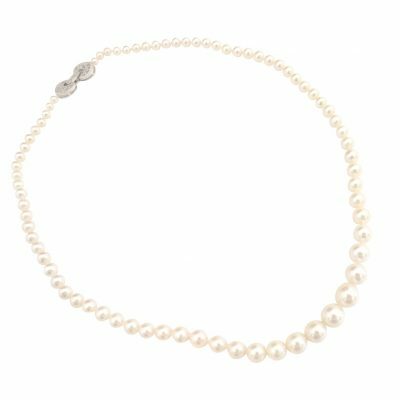 Graduated – A necklace with pearls of gradually increasing size with the smallest at the back and the largest at the center. Bib – A single necklace that includes nested strands of pearls of varying lengths attached to a single clasp. Torsade – A necklace in which several strands of pearls (usually freshwater) are twisted together and held with a special clasp. If you don’t see what you are looking for, however, or you aren’t even sure what would look good on you, you are still in the right place. Our jewelry designers can help you figure out what style will best complement your skin tone and neckline, and create a one of a kind necklace that will be sure to set off your own natural beauty. Discover what style necklace would best suit your frame. Your skin tone will determine the range of colors that will look best. The blush can be brought out in fair skin by using rosy hues, while deeper skin tones glow against cream colored pearls. You can pull a color from a patterned dress or match pearls to a favorite blouse and colored pumps for a perfect ensemble. The style of dress you choose or events you attend will also have an effect on a pearl necklaces appropriateness. Opera length pearls are traditionally worn with formal evening dress, while the more casual teardrop pearl or tin cup necklaces are used for cocktail hour. Click here to learn more about different types of pearl necklaces. The clasp you choose should complement the necklace in both quality and style – either 925 pure sterling silver or 14 carat gold are the most favored choices, and we have a wide variety available for you to choose from. Click here to view our selection. To sum up, to order your custom necklace, first choose your pearls – shape, size and color – and any additional stones or other accessories you wish to include. Next select a style, and finally pick out a clasp. You can browse our loose freshwater and cultured pearl pages for color and shape selection, and use the guide below to indicate the desired style. One of our specialists will assemble your custom necklace and it will be shipped to you as soon as possible! Still remember these ladies? Cindy McCain, Sarah Palin? Then of course, Michelle Obama, all of whom have been bringing pearls back to the political circuit with passion and flair. Cindy’s chunky baroque pearl necklace had irregular pearls that complement her dressy suits, while Sarah Palin opted for the classic traditional look in a sleek single strand of perfectly matched pearls on her campaign trails. The First Lady Michelle has regularly been seen with various designs of pearls. She has sported the classic double strand pearl necklace on several occasions, such as Easter Sunday, while visiting schools and care centers, and even for her audience with the Queen of England. Then again she made a splash wearing pearls – this time in Vanity Fair`s list of the Best Dressed People in 2009. If you don’t have upwards of $25,000 on hand to invest in the exact style, (who has it or who wants to these days? ), don’t despair. We can get you the same gorgeous look in real pearls for under $30, and no-one will be able to tell the difference! See details on our real pearl necklaces, or see more of these celebrity inspired styles!